You ain't seen nothing like it in any amusement hall. 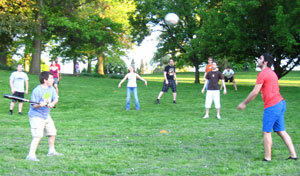 Silverball is a fast-paced and high-scoring game of human pinball, a cross between baseball and soccer, played on the side of a hill. Flippers and Poppers on the offensive side clobber soccer balls with baseball bats, shooting through gates and off of bumpers to score. Meanwhile, defensive Knockers block and steal the ball, attempting to kick it past the Flippers, down the drain, and out of play. Because the action doesn't stop when points are scored, teams earn thousands of points in a continuous, non-stop barrage of play. And that's even before the multi-ball feature is activated. 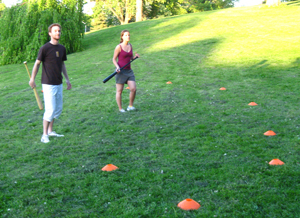 Adam Nelson - Adam began designing sports and games after founding Obscure Games Pittsburgh in August of 2009. A graduate of the University of Pittsburgh with a rather dull job-for-money, Adam started Obscure Games as a way to encourage himself and his friends to go out and play again, just for the fun of it. Almost immediately, play consumed him. Since 2009, Obscure Games has grown to include dozens of members and has been sponsored by a grant from the Sprout Fund, a Pittsburgh non-profit foundation. From August 27-29, 2010, Obscure Games will host the Steel City Games Fest, a celebration of play in Pittsburgh. More about Obscure Games Pittsburgh, including rules for games, is online at www.obscuregamespgh.com.